We are attached to many different gizmos and gadgets, but our phones take priority. They see the most use, and have almost become a necessity in daily life. It tells us where our friends and family are, what’s happening in the world, and gives us a laugh through cute pictures of cats. The only thing that stresses us out about these devices is that they don’t hold much of a charge. 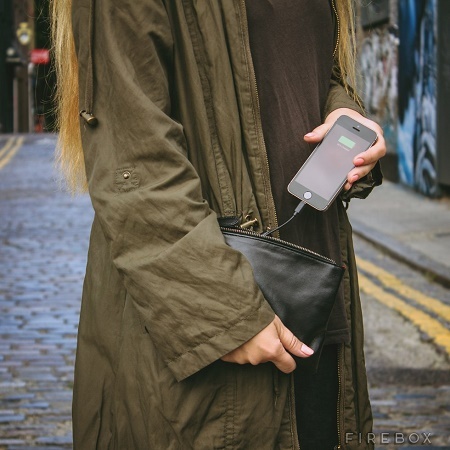 While it’s a good idea to keep a backup battery around, not everyone carries around a bag that was made large enough to hold them. If you prefer to carry a smaller-sized purse, but want to travel as inconspicuously as possible, then you might like the Clutch Boost Purse. This is, as the name states, a clutch purse that has a backup 2600mAh Samsung lithium-ion battery inside. Though it is hidden in the material of the purse, the brushed-aluminum power pack can be detached for separate use. The clutch is made of PU leather, which means it is less likely to stain or fade over time. There is room for necessities inside the clutch even with the battery pack inside, but don’t go thinking you can fit everything from a normal-sized purse in there. It will cost you $47.95, which isn’t too bad for a new purse and battery pack. This comes with both a micro-USB and lightning cable adaptor so that this can be compatible with both Android and Apple devices.